Situated in the North-East region of Vietnam, Halong Bay is a bay in the Gulf of Tonkin comprised of regions of Halong City, the township of Cam Pha, and a part of the island district of Van Don. Halong bay borders Cat Ba Island in the southwest, the South Pacific Ocean in the east, and the mainland, creating a 120 km coastline. Viewed from above, Halong Bay resembles a geographic work of art. While exploring the bay, you feel lost in a legendary world of stone islands. There is Man`s Head Island, which resembles a man standing and looking towards the mainland. Dragon Island looks like a dragon hovering above the turquoise water. La Vong Island resembles an old man fishing. There are also the islands of the Sail, the Pair of Roosters, and the Incense Burner, which all astonishingly resemble their namesakes. The forms of the islands change depending on the angle of the light and from where the islands are viewed. At the core of the islands, there are wonderful caves and grottoes, such as Thien Cung (Heavenly Residence Grotto), Dau Go (Driftwood Grotto), Sung Sot (Surprise Grotto), and Tam Cung (Three Palace Grotto). 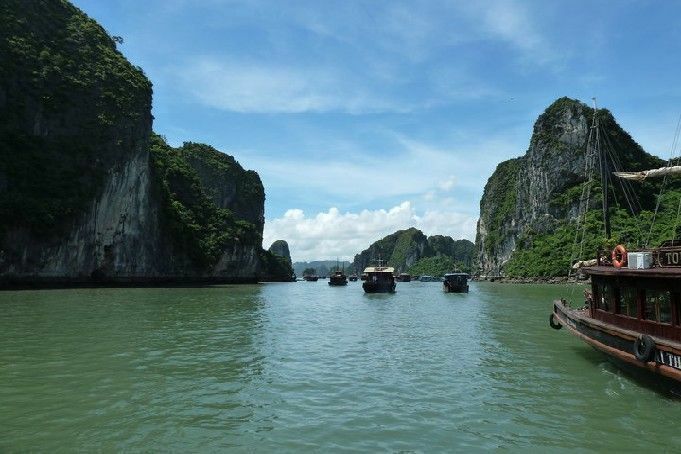 There is different scale of prices for overnight tours to Ha Long Bay but beware that we just get what you pay for. Price differences are based on the quality of the boat, food, accommodation, transportation, crew as well as other invisible elements. Frequent questions to ask before making a booking are the group size on boat and on car, cabin type (with or without A/C), included and excluded services in the package so that you know what to expect in advance.